Since the Legislature adjourned July 20, we've experienced some changes in representation of the 39th District. 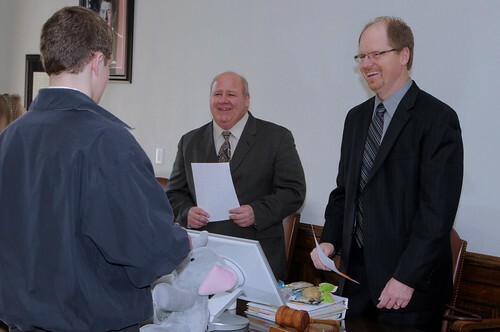 Representative John Koster, who returned to the Legislature in January after 17 years, was named executive director of the state's County Road Administration Board and submitted his resignation effective Aug. 31. The Republican precinct committee officers in the three counties represented by the 39th District (King, Snohomish and Skagit) met in September and submitted three names to their respective county councils/commissions. From those names, Sultan Mayor Carolyn Eslick was appointed Sept. 20 as the newest state representative for the 39th District. I would like to thank John Koster for his work during the short time back in the Legislature. I appreciated his knowledge, especially about local government, from his experience serving for many years on the Snohomish County Council. I wish him well in his new position. I would also like to congratulate Carolyn Eslick as my new seatmate. I had the opportunity to get to know Carolyn during her many years serving on the Sultan City Council and as mayor. She will be a valuable asset to the 39th legislative seat. Also, this week it was announced Sen. Kirk Pearson will soon be leaving his 39th District state Senate seat to take a position with the Trump Administration. Kirk has been named director of rural development for Washington state under the U.S. Department of Agriculture. He served in the Legislature for the past 17 years, and prior to that, had worked as an aide for the late U.S. Rep. Jack Metcalf. I have appreciated working with Kirk for all of the years that I have served in the Legislature. He has served our district well and I'm certain will do a tremendous job overseeing rural development for our state. Sen. Pearson's departure begs the question, what's next for that position? First, I do not intend to pursue the open Senate seat. While it is an honor for any person to be considered for the “upper chamber,” and Kirk's shoes will be hard to fill, my greatest honor is serving in my current position as leader of the House Republicans. In my leadership role in the House, we've made some tremendous gains — 48 House Republicans — just two seats away from the majority and one seat away from a tie vote. I'm also proud of our accomplishments in K-12 education funding, transportation, public safety, job creation and protecting the state's most vulnerable populations. However, our work is not finished. So with the help and support of my caucus, I wish to stay in the House representing you and carrying out the important work we have before us. The process of selection for a new senator will be the same as the process used to fill John Koster's vacancy. I look forward to a quick appointment and working with our new 39th District senator. Although it will be later this month before Tuesday's election is certified, if the numbers hold, Democrats would pick up a seat, giving them a majority in the Senate and altering the balance of power in the Legislature. Since December 2012, the Senate has been under the control of the Majority Coalition Caucus (MCC), which consists of 24 Republicans and one Democratic senator who caucuses with the Republicans. The election would now give Democrats 25 seats to 24 for Republicans. Why is this significant? It means Democrats will soon control both chambers of the state Legislature and the executive branch (governor's office). For the past five years, the balance of power — Democrat majority in the House and Republican (MCC) majority in the Senate — has ensured Washington citizens have a full representation from both parties. It has forced both parties to come to the table to negotiate difficult issues — including the McCleary K-12 education funding issue. The result is that we've produced bipartisan state operating budgets that have the full input of both Republicans and Democrats. The MCC was also able to stop massive tax increases proposed by Democrats and the governor. The change in majority effectively removes this restraint and creates one-party rule in the statehouse. What does this change mean for Republicans? As the House Republican leader, I am committed as ever to our agenda of protecting taxpayers, holding state government accountable, empowering families, strengthening our communities, and providing students with a world-class education. The power shift in the Senate means Republicans will need to work harder for all citizens. We will extend our hands across the aisle with our Democratic colleagues and continue to offer them our alternative solutions to the challenges that face our state. Has the state met its constitutional duty under the state Supreme Court McCleary decision? After pouring an additional $4.6 billion into K-12 education since the Washington State Supreme Court's original McCleary ruling in January 2012 and another $7.3 billion in the next four years from the 2017-19 state operating budget we passed in June, most of my legislative colleagues and I believe the state has met its constitutional requirements. K-12 education now represents more than 50 percent of the operating budget for the first time since the early 1980s. We've made reforms to ensure every student, regardless of ZIP Code, will receive the best quality education possible. The court said Washington must stop relying on local school district property taxes to pay teachers, school administrators and classified staff. We did that by passing House Bill 2242, which places the primary responsibility of K-12 education funding onto the state through a method of levy reform. Teacher salary begins at $40,000, plus a 10 percent increase for Certified Instructional Staff after five years. There's a maximum salary of $90,000 and a district-wide average salary of about $64,000 per teacher. You can read more about the McCleary solution here. After all these advances for K-12 education, the attorney in the McCleary case, Tom Ahearne, argued before the state Supreme Court on Oct. 24, that Washington is still far short of amply funding education as required by the state constitution. Ahearne wants the Legislature to re-write the two-year state operating budget and allocate another $2.1 billion for teacher salaries during the upcoming short session in January. Republicans and Democrats in the Legislature have worked hard to ensure sufficient funding is allocated for our public schools. After hearing the arguments before the court, I wonder if there is no limit to the amount of money that would satisfy the plaintiffs in the McCleary case. How much is enough? Deputy Solicitor General Alan Copsey, representing the state, argued lawmakers have done enough to meet the court's remaining demands. We now await the court's response. You can watch the latest McCleary arguments online here on TVW. I had hoped by now negotiations would have produced both a fix to the controversial state Supreme Court's Hirst decision and a capital budget. Unfortunately, an agreement on Hirst has not yet been reached. If you haven't followed this issue, its important for every property owner in the state to understand the repercussions of Hirst. Just over a year ago, the high court ruled on Whatcom County vs. Hirst, Futurewise, et al. decision that Whatcom County failed to comply with the Growth Management Act (GMA) requirements to protect water resources. The court said all formerly permit-exempt well applications must now be examined for impact on instream flows. The Hirst decision also shifts responsibility for water appropriations for these small withdrawals from the Department of Ecology onto local county building departments. Counties have said they cannot afford to foot the bill for hydrologists to prove individual wells would not affect in-stream flows of local waterways, so they are either denying building permits on these properties or have told the landowners to pay for costly hydrology reports. This is effectively shutting down development on these properties. At least one lender has said it will not extend loans to those affected by Hirst. Land values are plummeting and the rest of us will be paying higher property taxes as those taxes shift with lower assessments. A Republican-sponsored measure, Senate Bill 5239, to permanently roll back the Hirst decision passed the Senate four times. However, Democrats in the House have refused to bring the bill to the floor for a vote. Instead, during negotiations, they offered a temporary 24-month window for wells to be dug, with a provision that would have given Native American tribes final authority over water decisions. After the two-year window, Hirst would remain permanent. That is unacceptable. Republicans in the Senate have said they will not pass a capital budget until a Hirst fix is in place. The Legislature is scheduled to meet for committee assembly days in Olympia, Nov. 15 – 17. Optimistically, that could provide an opportunity to pass both measures. I work for you throughout the year. If you have questions, comments or suggestions about legislation and state government, please call my office in Olympia. You'll find my contact information below. Thank you for the honor of allowing me to serve you!